Over the past few weeks Google has added in-app Uber booking and parking availability to Maps, but it isn’t done with the improvements. In an update rolling out today, the app will receive some better navigation—not in how we drive but in how we get around the app. Under the new places tab, users will find lists of restaurants and bars around you, as well as a search bar that lets you find ATMs, pharmacies, gas stations and grocery stores. Additionally, if you tap the car icon you’ll be able to quickly get an estimated time of arrival for going home or to work, as well as traffic conditions and any possible reported delays. Finally, the subway icon will show you the best train or bus to catch for your commute, or you check out schedules for stations and stops near you. 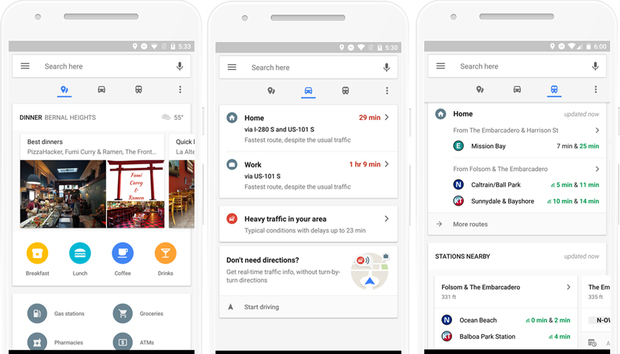 Google Maps’ new navigation helps you get the information you need quickly. The impact on you at home: We all love Google Maps, but let’s face it, no one wants to spend any more time with it than they have to. With this latest update, Google hasn’t added any new features, but by streamlining the interface a bit, it will help us get where we’re going that much faster. « What's keeping enterprises from using G Suite?